The practical way to bring out the best in yourself and others. Want to find out how to develop your strengths at work – and help others do the same – using the science of positive psychology? Boost your levels of confidence, energy and effectiveness at work by discovering your strengths – or as we like to call them your neurological superpowers – using popular tools like the VIA Survey and Gallup Strengths Finder. Improve your wellbeing and performance by finding intelligent ways to do more of what you do best each day so you can avoid underplaying or overplaying your strengths. Align your daily tasks, job description and career plans to maximize your strengths by learning the skills of job crafting. Build better relationships with your colleagues, your partners and your clients by learning to spot and value the strengths in others – yes even the most challenging people you work with! Grow a strengths-focused team culture by aligning people’s strengths, feedback and development to harness their neurological superpowers. 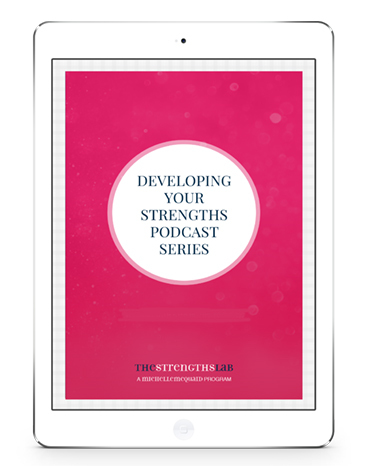 This series is an effective, affordable, and portable way to discover and develop your strengths at work and help others to do the same. Elise Morris is a positive psychology practitioner, speaker, facilitator, coach, and disruptor with over 25 years of experience working in global and locally based corporate and public sector organisations (including Swisse, iSelect, SEEK, Kraft, Cadbury, Pacific Brands and the CFA). Cheat sheets for each episode that include strengths challenges for you and your team, so you can immediately apply what you’ve learned and keep key ideas at your fingertips every day at work. Lifetime access to all the materials, so you can work at your own pace and use this series over and over again. Click the green “Add to Cart” button on the left to get the Developing Your Strengths Podcast Series.